At first glance, the weather might not seem like the most interesting or exciting topic. I get it. 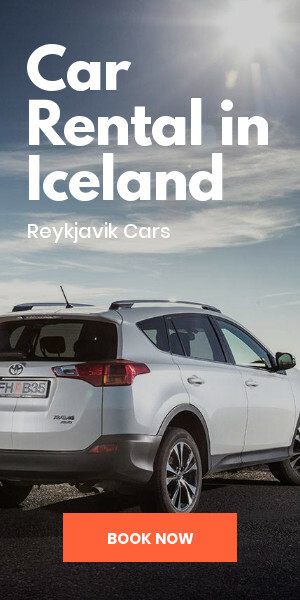 But Iceland's climate can have a huge impact on your travel plans. You might even decide to go during a specific time of year because you think it's the best one weatherwise. It will most certainly affect what you pack. And let's not forget daily hours of sunshine. Reduced daylight hours in the winter and the nearly endless sunshine of summer’s Midnight Sun change the scope and the amount of time you have to partake in the day's activities. So when planning your trip, it's important to know what to expect during each month. Let's look at average monthly temperatures, daylight hours, and precipitation throughout the year in Iceland. The country’s notorious weather changes a lot over 365 days and you need to be prepared. 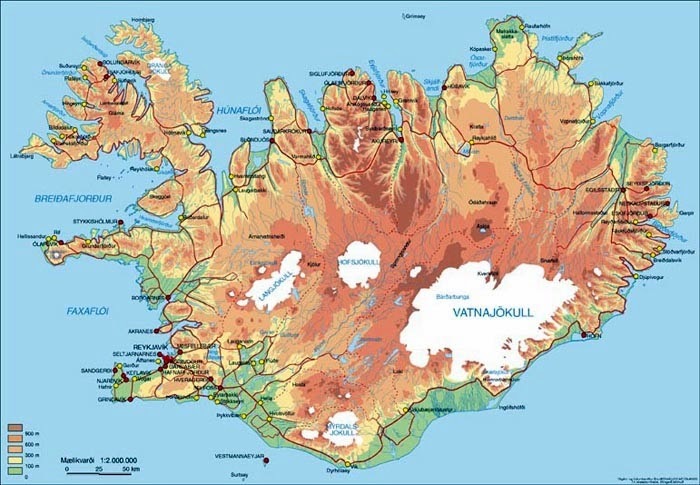 As a general overview, let's locate Iceland on a map. It rests close to the North Pole just south of the Arctic Circle. It gets pretty cold, but thanks to the warming effects of the Gulf Stream, it's not as freezing as you might think. It's true that the hottest months in Iceland are in the summer, but “hot” is a relative term. depending on what you're used to the Mercury reading on thermometer generally doesn't get above 59 ºF (15 ºC), even on the warmest days. Not exactly what I'd call a heatwave. You can also only do certain activities, like glacier cave exploration in Vatnajökull or Langjökull, during the frostier months. 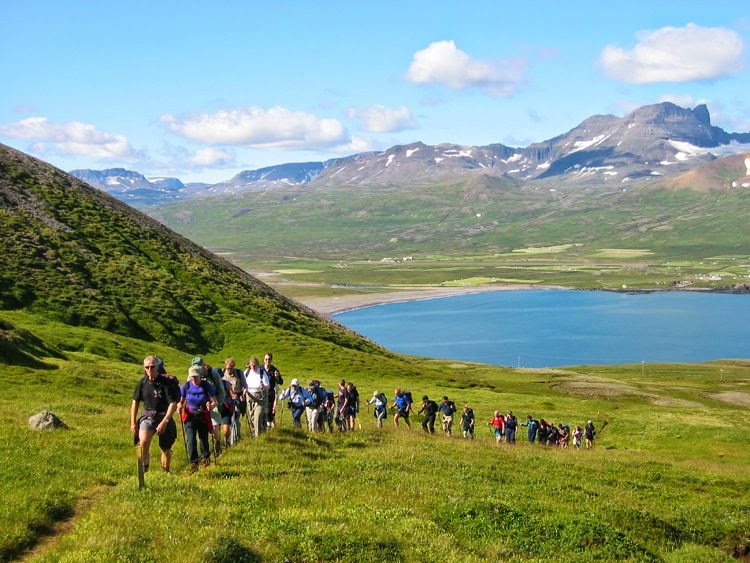 In the summer, thanks to the Midnight Sun, you've got plenty of hours to go hiking in places like Landmannalaugar or taking a dip in places like the Blue Lagoon. But the drawback of all this summertime sunlight is that the Northern Lights are not visible. You'll find January cradled right in the middle of the Icelandic winter. It's the darkest, coldest month here. But that's not all bad news. Take advantage of cool outdoor activities like skiing, snowboarding, snowmobiling, hiking on Skaftafell glacier or even exploring an ice cave. The average monthly high is Reykjavik is around 35.4 °F (1.9 °C) for January. Average monthly lows for Reykjavik hover around 26.6 °F (-3 °C). January is one of the wettest months in Iceland both in terms of precipitation that falls and the number of rainy or snowy days. You’ll see three inches (7.6 cm) of rain, snow, sleet, hail, etc. over 13 days if you come during this month. Be very careful when driving. Bring waterproof clothing and remember to pack your sunscreen. There are also cold yet clear days in January in Iceland. Even though we’ve passed December’s winter solstice, the days are still extremely short (between 4.5 to at the beginning of the month to about seven at the end). The sun typically rises between 10-11 am and sets between 3:45 and 5 pm in January. Weatherwise, February is quite similar to January. We’re still in the thick of Icelandic winter and it still pretty cold and wet. You can still partake in the winter activities mentioned in January. 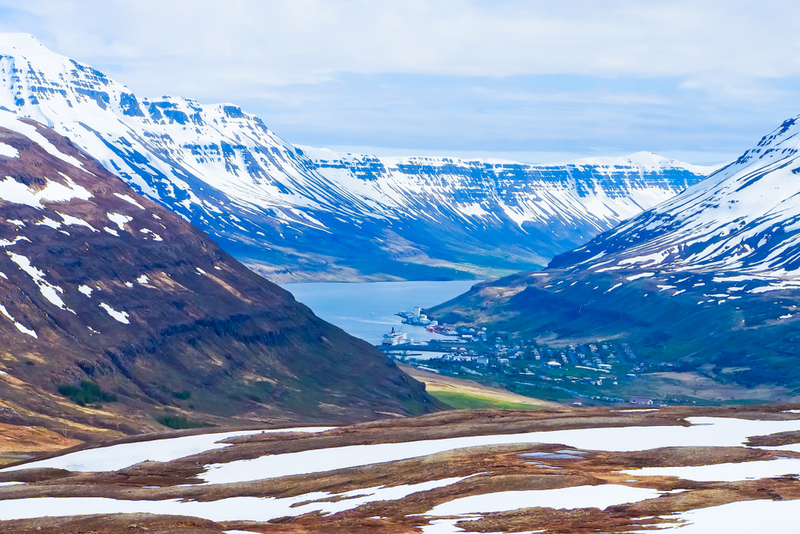 Head to Akureyri and Dalvík if you’re interested in hitting the slopes. The ski capital of Iceland awaits. And be sure to take a Northern Lights excursion, as this is one of the best times of year to see the majestic light show in the nighttime sky. The average monthly high is in Reykjavik is around 37 °F (2.8 °C) and the low is around 28.2 °F (-2.1 °C). February gets around the same amount of snowfall and other types of precipitation as January, with 2.8 inches (7 cm) spread out over 13 days. By February, the sun has started to come out more. The days are longer now (between seven to ten hours). The sun rises between 8:30 am and 10 am depending on the time of the month and sets between 5:15 pm and a quarter till seven. We've left the permafrost of winter but March temperatures in Iceland are still quite low. Here's some good news: We've got way more daylight hours and the amount of sunshine is beginning to resemble that of countries a little closer to the Equator. As we slowly march towards summer, things only continue to get better on our lovely Nordic island. In Reykjavik, March average highs reach 37.8 °F (3.2 °C). Monthly average lows are around 28.4 °F (-2 °C). March has even more rain than January and February, with 3.1 inches 8 cm over 14 rainy days. Temps are still hovering around the freezing mark, so you're likely to get caught in some cold rain and snowy conditions. Bundle up and dress in the right layers so the water doesn't creep in. The sun rises between 7 am and 8:30 am and doesn't go down until close to 7 pm or 8 pm. Talk about long days! And the number of minutes of sunshine keeps increasing daily. March gets between 10-13 hours of sunlight per day. April represents a turning point in the shift from winter to summer. It's no longer "winter cold" but don't break out your swimsuits just yet. This Icelandic version of winter is slightly more bearable but you still need to dress warmly in waterproof, breathable layers. We're also really excited to be getting plenty more daylight hours. 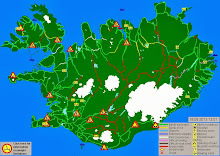 High temperatures in Reykjavik hover around 42.3 °F (5.7 °C). The average low for the month dips to 32.7 °F (0.4 °C). Brrrrr! 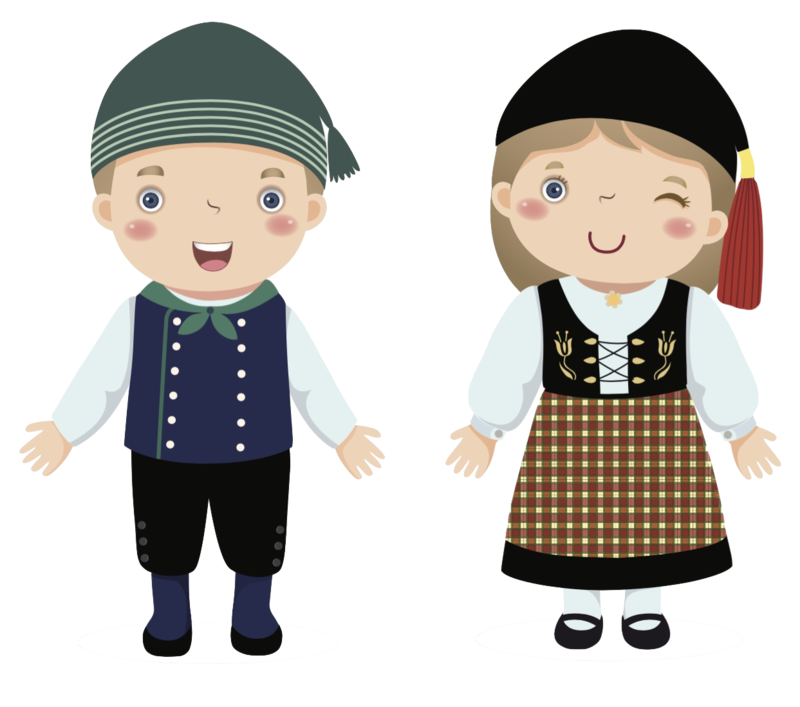 One of the central themes of dressing for Iceland is to use plenty of layers and be prepared for anything. This is especially true for transitional months like April. One day, you'll have not a cloud in the sky. The next day, a hailstorm pelting you. The next, massive amounts of sleet or snow. Or it could happen all in the same afternoon. April in Reykjavik sees slightly less precipitation than previous months. There are 12 rainy days with around 2.4 inches (6 cm) of precipitation. April provides you with a fill of sunlight. Depending on where we are in the month, the sun can rise anywhere from 5am and set as late as a quarter to ten at night. With 13.5 to 16.5 hours of sunlight, talk about a long day! 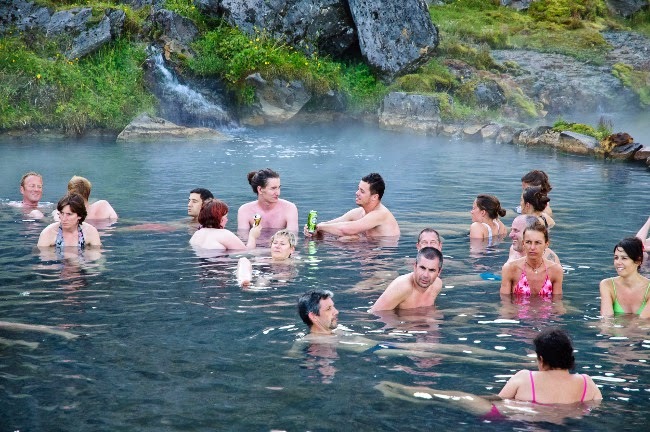 We're in the home stretch for Iceland's summer and things are heating up quickly. Well, for us at least. You can definitely tell that summer is around the corner with both temperatures and daylight hours. Our beloved whales and puffins have not yet made their annual return to our island but rest assured, they're on their way. The good news for travelers is that May is sunnier than previous months and less windy and icy. You'll definitely want to go outside. While May is sunnier and less windy than other months, you need to be prepared for everything. Even though the weather is nicer, you can still encounter snow, sleet, rain, etc. May has only 1.8 (4.5 cm) inches of precipitation spread out over ten days. We're starting to approach really long days in May. With 17-20 hours a day, the sun is up when you awaken and possibly setting when you go to sleep. The sun rises between 3:30 am and 5 am and sets between 10 pm and 11:30 pm. I hope you brought your sleeping mask or that you have blackout curtains. It's the month you've been waiting for. Summer has arrived! The country's flowers are in full bloom and snows have melted, revealing beautiful green countryside scenery. It's also the beginning of outdoor festival season. Make sure you pack your camera. Reykjavik's average monthly high is 53.1 °F (11.7 °C). Lows for the month on average are a bearable 44.1 °F (6.7 °C). When traveling to Iceland, June is a pretty sure thing where the weather is concerned. By don't think you're completely off the hook. We've had snowstorms in June and 2018 was a particularly cold, rainy, overcast exception to years past. June receives 2 inches (5 cm) of precipitation over 11 days. June in Iceland means the summer solstice, usually around the 21st or 22nd of the month. This means one thing: the Midnight Sun. Nearly endless daylight envelops the island. As a visitor you'll have time to fit in an extra excursion like additional stops on the Diamond Circle route or stopping by Seljalandsfoss, Skógafoss and the Sólheimasandur beach plane wreck. With the sun setting between 11:30 pm and midnight and rising between 3 am and 3:30 am, you'll have plenty of time for outdoor pursuits. Just come prepared with an eye mask. 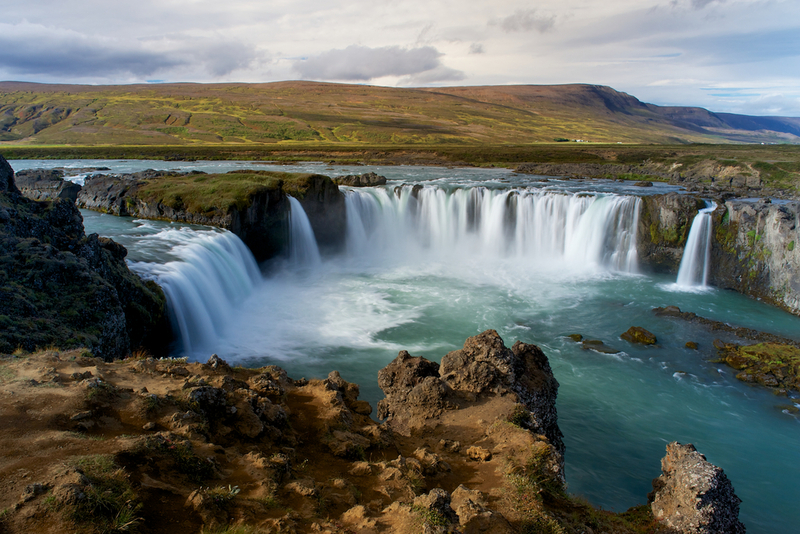 July is understandably one of the favorite time of year to visit Iceland. Temperatures outside make it perfect for taking part in pursuits like hiking in the Highlands. Access to Landmannalaugar and F-Roads has reopened and the interior of the country is just waiting to be explored. Make sure you've rented a 4x4 vehicle. July is probably Iceland at its best. July is probably the "hottest" month in Iceland. Average highs in Reykjavik are 55.9 °F (13.3 °C). Average monthly lows get to 46.9 °F (8.3 °C) which is not super warm but not freezing either.. You'll still need to bundle up at night. July is probably as good as it gets in Iceland when it comes to the weather. Go outside and take full advantage! July is the warmest month in Iceland on average, so take advantage of all of those extra daylight hours and get outside! 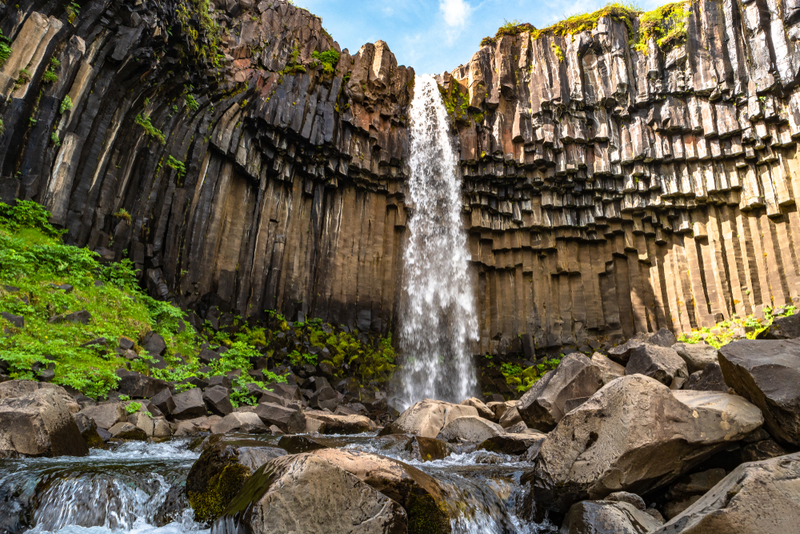 With only 10 days of 2 inches (5 cm) of rainfall, why not take a relaxing soak in some hot springs or hike a volcanic crater like Askja or Eldborg during your Iceland road trip? We've still got lots of sunshine in Iceland in July with 18-21 hours per day. The Midnight sun continues during July with the sun rising between 3 am and 4:30 am and setting. between 10:30 pm and midnight. 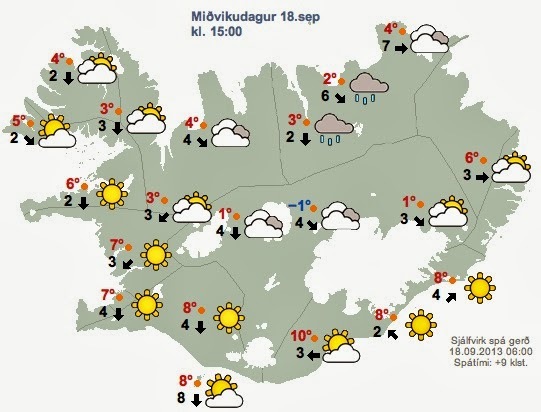 Temperatures are still high and the weather is still quite nice in Iceland in August. But the Midnight Sun has begun its slow retreat. The average monthly high is 13 °C (55.4 °F). The average monthly low is 7.9 °C (46.2 °F). August is still a wonderful time of year to visit Iceland. You’ve got the nicer weather and sunny days similar to June and July and still have pretty high temperatures. 2.4 inches (6 cm) of precipitation is spread out over 12 days. The sun still rises relatively early (between 4:30 am and 6 am) and also sets relatively late (between 8:45 pm and 10:30 pm). But you're still getting 15-18 hours of sunshine daily. This is less than previous months, but is still quite a lot. September in Iceland marks the beginning of the end of tourist season. The weather slowly starts its metamorphosis from summer to fall and winter. The Northern Lights start to appear again as temperatures slowly being to dip. 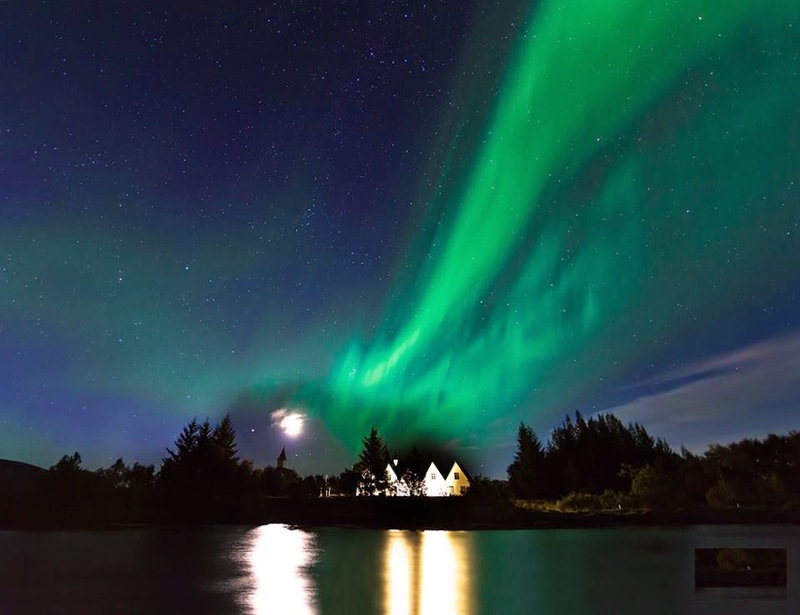 This is the perfect month to visit Iceland if you want to see the Aurora Borealis but are looking to avoid the extreme cold of the upcoming months. Going camping or taking a road trip are fantastic options for exploring the island. September's monthly averages are a high of 50.2 °F (10 °C) and a low of 41 °F (5 °C). They're a bit lower than summer temperatures but still nice. As we've started the change from summer to fall, you start to find more overcast days. Things are cooling off and you'll find an increase in rainfall. Reykjavik sees 2.6 inches (6.5 cm) fall over 12 days. September's daily hours of sunshine are probably closer to what you're used to back home. You've got around 11 and a half to 14 and a half hours of sunlight with the sun rising between 6 am and 7:30 am. It sets between 7 pm and 9 pm. You'll definitely sense the change in seasons during Iceland in October. It's colder, the leaves are changing color, and it's wet during the whole month. You can still plan a pretty good trip though, as winter hasn't quite arrived yet. Monthly average highs for Reykjavik are 44.2 °F (6.8 °C) and lows are 36 ºF (2.2 ºC). You'll need lots of warm layers, wool socks, and thermal underwear if you hope to stay nice and toasty. I think the best way to prepare for Iceland in October is to plan for what would be a blustery, wet, wintery day in most parts of the world. You'll need waterproof and water resistant clothing as this is Iceland's wettest month. A shell layer such as a rain jack is also a basic requirement. Wind, rain, and storms are abundant during this month. You've got 15 days (half the month) of precipitation with 3.3 inches (8.5 cm) in Iceland in October. Pack well! We're inching closer to winter solstice every day. October is a bit of a mixed bag when it comes to daylight hours. There can be as many as eleven or as few as eight. Sunrise happens between 7:30 am and 9 am. Sunset is between 5pm and 7 pm. Forget what Jon Snow said. Winter isn't coming; it's already here. 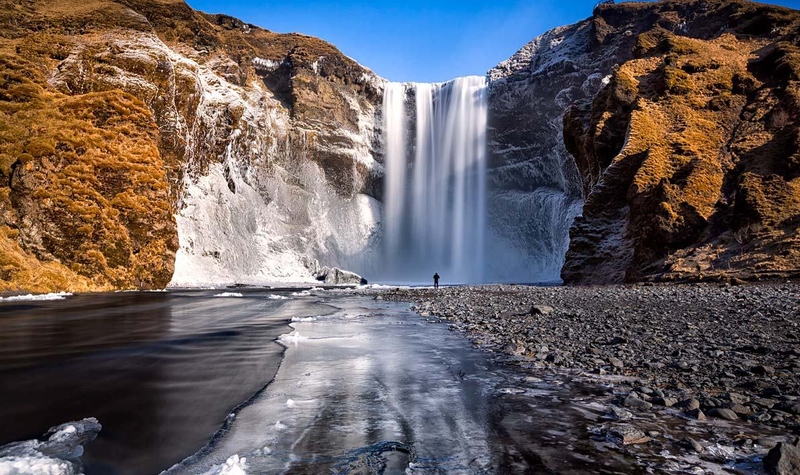 Iceland's winter arrives earlier and leaves later, thanks to its far northern latitude. We're back to freezing temperatures and reduced daylight hours. Iceland is cold in November! With an average monthly high of only 38.1 ºF (3.4 ºC), you'll definitely freeze your buns off if you're not properly dressed. Due to large amounts of precipitation and temperature that hover around the freezing point, expect lots of sleet, snow, and freezing rain in Iceland in November. It can be quite overcast and cloudy. You may also have to drive in fog or with low visibility. Sunlight starts to become a bit scarce in Iceland in November. We only have around five to eight hours per day. The sun rises between 9 am and 10:45 am and sets as early as 3:45 pm to 5 pm. This is the perfect time to explore Icelandic café culture or Reykjavik's bars on Laugavegur street. 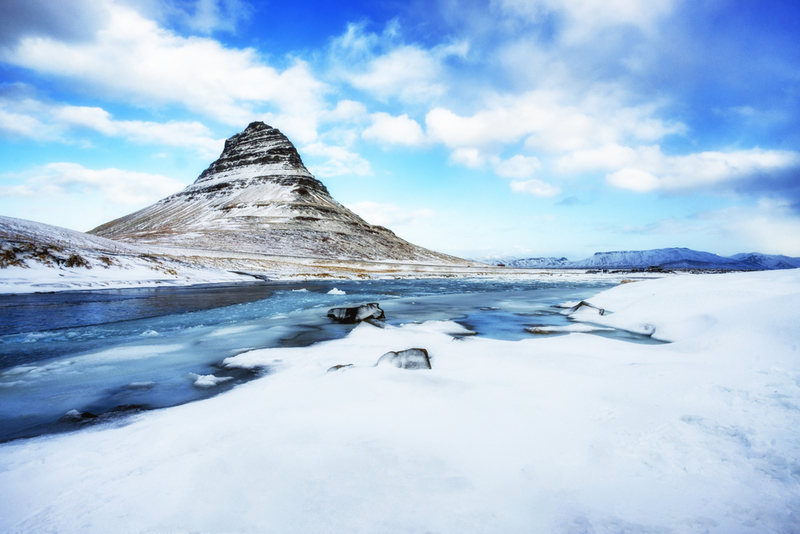 Iceland becomes a winter wonderland during the Christmas season. The country is blanketed in snow and looks like one big, beautiful snow globe. Thanks to the warming effects of the Gulf Stream, Iceland is not as cold as you might think. A good point of reference might be winter in New York. Somewhere like Chicago is worse than Iceland during the winter. Temperatures in Iceland stay right around the freezing mark on the thermometer in December. 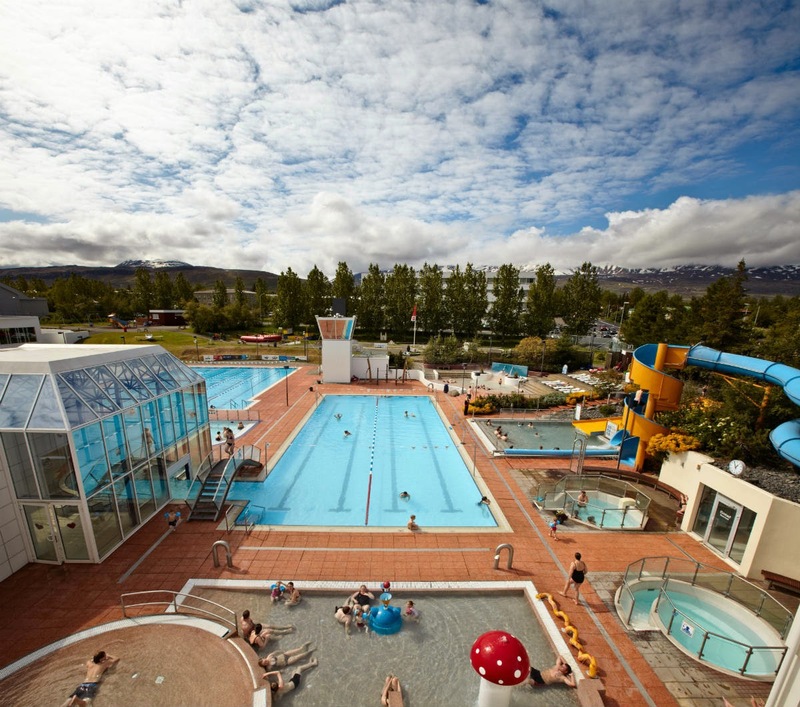 The average monthly high in Reykjavik is 36 ºF (2.2 ºC). Yikes! Icy, cold, snowy, and wet are the four words that best describe Iceland in December. Driving is especially challenging, so as tip, please give yourself lots of extra time to arrive. You never know what inclement weather could delaty your travel plans. Hailstorms, fog, snowstorms and wind are all conspiring against you in December. Never be afraid to turn back or wait out the storm. Over 14 days, you'll have 3.1 inches (8 cm) of precipitation. With only four or five hours hours of sunlight per day, December is probably the bleakest month of the year. We're dealing with the winter solstice, which means the opposite of the Midnight Sun. The sun rises between 11 am and 11:30 am and sets around 3:30 pm. At least we have Jól (Christmas) to look forward to! One of our favorite websites for checking daylight hours along with sunset and sunrise times for Iceland is www.timeanddate.com. It provides not only sunrise and sunset times, but also information about civil twilight. We got all of our information regarding hours of sunlight there. You can check the specific dates of your trip to know how much time you have for your activities. Another useful site is the official website of the Icelandic Meteorological Office. Each month has its own special charm, and no matter what time of year you go, you're sure to have an incredible adventure. Just pick a month when you know you can deal with the weather!